at bob's big boy in downey, you never know what will show up or not. hasn't been as interesting the last few weeks, as i think a lot of cars are heading to other shows. only advantage is that bob's runs their shows year round, and the others will end around october. i end up going to the other shows and also to bob's, so i'm not missing too much. but it does tend to have a different feel being there now than it did back in march. different crowd. whatever. 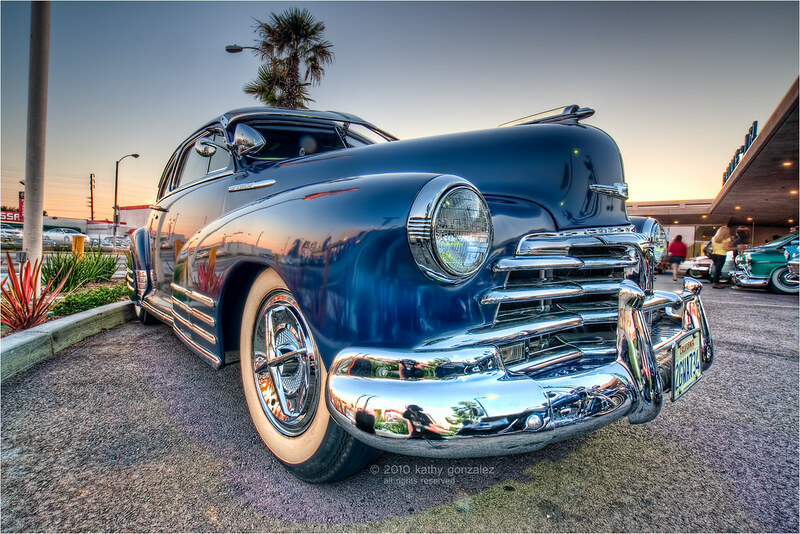 this 1948 chevy fleetline was immaculate. guy parked it in the corner of the front lot. don't know what his problem was, but he left right after i got my shots. seemed anxious to get going. said something snippy that i can't quite remember now, but i don't care, didn't seem to be about me. for that guy that can never remember my better half's website, here's a link to big pixel pusher's version from the same night.